This was one of the final images from Sky Blue FC's match vs. Seattle but you won't believe what led up to this. 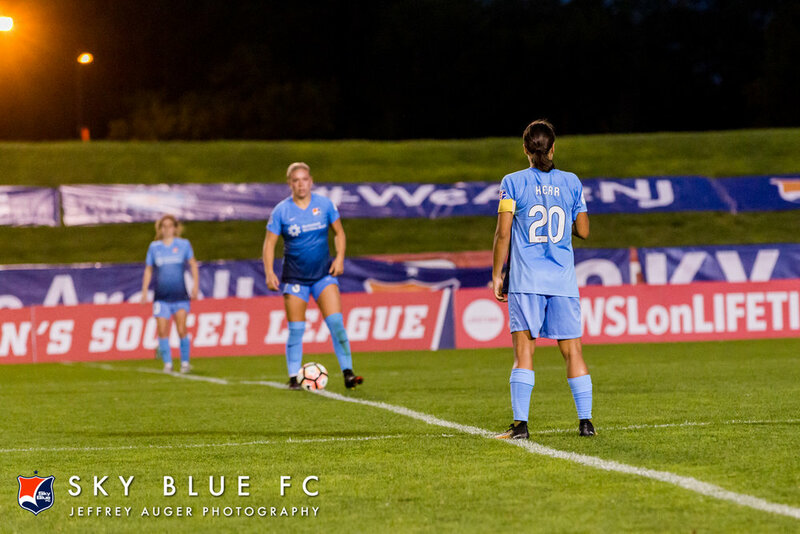 It was a long week for many within the Sky Blue FC organization. Their coach leaving one day and then shortly after their "Captain America" announcing she will be out of commission the rest of the season. This could have easily been a game to have chalked up to a "L" based on those happenings. The game quickly went the way many thought and at half time Sky Blue FC was losing 3-0. The fans, lead by Cloud 9 were not about to give up on their team. Great crowd. Little did they know what the game had in store for them. They have seen them fight through adversity before with late game drama and heroics. The team kept their composure and focused on one possession at a time. Then suddenly Sam Kerr strikes bringing the tally to 3-1. That brought extra life to fans and to the team. Before you know it another and then another goal from Sam Kerr evening the score at 3-3. But this was far from being done...much more drama to come. Maybe the effort getting the score even led to a brief let down. Just enough to allow Seattle to score the go ahead goal. Newly appointed co-captain, Sam Kerr. 4 minutes of extra time added to the match. Is that enough time to draw even once again? For this team, that was more than enough time. A minute into the extra time, Maya Hayes heads the ball into the back of the net. The crowd erupts knowing that they have somehow salvaged gaining a point in the standings. Maya Hayes evens the score at 4-4 in the first minute of extra time. But wait, there were 4 minutes added. Could they hold off the visitors from jumping in front once again? But Sky Blue was not playing for the tie, they wanted those three points! They continued to press and earned a penalty kick in what could be the final moments of the game. Kerr missed the shot but Sky Blue kept possession and now had Taylor Lytle set for a corner kick. She sends it across the middle and somehow a header is sent into the net. But who was it that rose above four defenders to head in the game winning goal? You guessed it...Sam Kerr! Here are the moments that followed. 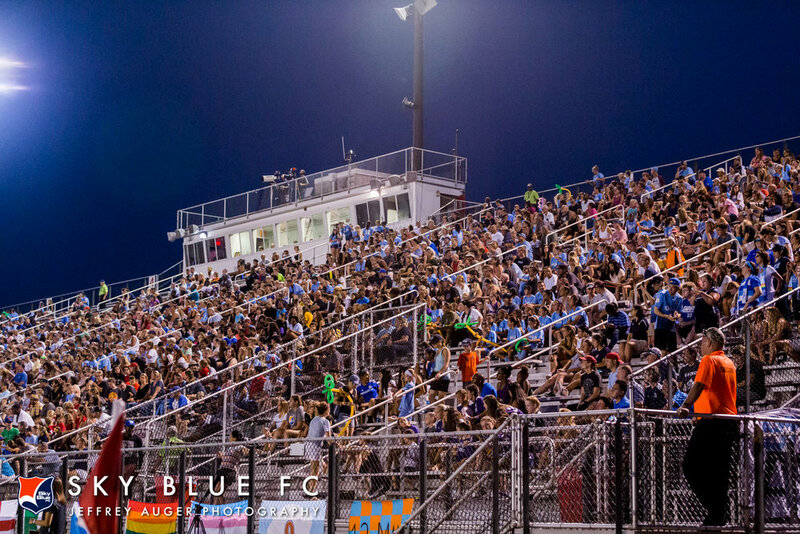 Congratulations to the entire Sky Blue FC team on a tremendous victory. If you have not seen Buddy Guy in concert what are you waiting for? Last night at the State Theatre NJ, I had my second opportunity to photograph blues legend Buddy Guy. At 81 years young, Buddy still puts on one of the best live acts that I have ever seen. He commands the stage with not only by his masterful guitar playing , his unmistakable voice but also as a story teller that is like none other. Needless to say he does not disappoint and is always a thrill to see him. He has carried on the genre of music which many see as fading away but he has found hope that the next generation and many more to come will still be witness to the blues — and his name is Quinn Sullivan. At only 18 years old, he is quickly becoming one of the best guitar players in the world. Buddy has taken him under his wing and together they tell their story through the music. The media had gathered once again in the heart of NYC at the Marriott Marquis for this year’s Heisman announcement. Not long after the television cameras were set-up and note pads filled with statistics were in hand, the friendly debate of what this prestigious award truly meant and who would be most deserving. The Heisman Trust defines it as the award given to college football’s most outstanding player and who best exhibits the pursuit of excellence with integrity. But the media and many of college football’s fans had difficulty in agreeing upon what this year’s ballots would reveal. Would it be the starting QB for the #1 team in the nation? How about one of the nation’s most durable and hard hitting running backs that punishes defenses as each game wears on? And how can anyone forget the flash and speed of a running back who now holds the NCAA record of most all-purpose yards in a single season. The three finalists in attendance for this award were all well deserving but the buzz in the room had Derrick Henry as the favorite. Henry, a soft-spoken kid from Yulee, Florida let’s his power, durability and break-away speed do his talking on the football field. Having rushed for 1,986 yards, breaking Herschel Walker’s SEC record for rushing yards in a season, many thought Henry was the front-runner. Henry sat low in his chair during one of the many media sessions he would have to endure over the next 48 hours. When asked about what the award would mean to him, he was grateful for the opportunity to play football and would then redirect the attention and praise back to his teammates and it being a team effort. Earlier in the week, Henry also earned the Doak Walker Award (Country’s top running back) as well as receiving the Maxwell Award (Collegiate Player of the Year). With an offense that wasn’t as explosive as they had hoped, Nick Saban quickly turned the focus of they attack to Henry. He carried the ball an astounding 339 times without ever showing signs of tiring. Henry finished the season strong with four games of 200+ yards all in the second half of the season. As the season grew tougher, so did Derrick Henry. But what about the electrifying kid from Stanford, Christian McCaffrey. With a combination of speed, power and elusiveness, McCaffrey broke the NCAA record for all-purpose yardage which had been held by Barry Sanders. And lastly, what about the Clemson’s DeShaun Watson? Even though he didn’t break records of former players who are now household names, all he has done is lead this team to the #1 ranking in college football. At approximately 9:20 pm on Saturday night, the voting results were finally revealed. Derrick Henry has been selected as the 81st winner of the Heisman Memorial Trophy Award. The media room was mostly quiet once this announcement was made. Many were sorting through their notes of the interviews the conducted the past two day’s with the newest Heisman winner. Henry is the first running back to win since 2009 (Mark Ingram/Alabama). As I opened up the media folder given to me, holding the ballot results, it showed that Henry won nearly every region with the exception of the “far-west” which was carried by McCaffrey. Only 293 points separated first and second place. The balloting and point system is the other topic up for debate that weekend as many media in attendance feel the representation lends itself to a regional bias. The “point system” and required first, second, and third place designations on each ballot were put in place to help avoid such bias when requesting the representatives’ votes. While it was hard to find fault the voters decisions, I was actually a bit surprised the award did not go to McCaffrey from Stanford. He was the kind of kid who makes the games exciting from start to finish. You never knew when he would make his next highlight reel play. Not only were his plays electrifying, he carried his team while finishing with only two loses on the season. Unfortunately, many of us on the east coast did not get a chance to see many of these game changing highlights with the exception of the occasional SportsCenter highlight. In the days after the Heisman announcement, many voters stated they didn’t even see McCaffery’s 400+ yard performance against USC and had cast their vote previous to that week’s games. Can I be one of the first to start hyping McCaffrey for the Heisman in 2016?